It's done however the person sponsoring the prize wants to do it. There's no direct link to the leaderboard from the Pointless menu, but the FS web app supports arbitrary hashtag-based leaderboards. So for this pointless prize, based on bikedavid's hashtag #FS2019dumplingride, the leaderboard is here. Would prefer the hashtag but if you'd like to track via the forum that is fine. Then it increases traffic to the forum and we can all salivate over your photos! Those dumplings doesn't sound appetizing but am impressed that you had dumplings with coffee! I associate having dumplings with tea, soy milk, or beer but I suppose it's like having coffee with something savory for breakfast. Kudos! Dumpling ride #2: steamed chicken dumplings at Mo:Mo House in Vienna. The cumin and turmeric flavors in these Nepali dumplings were a nice change of pace from the traditional East Asian dumplings I usually get. Bonus points for friendly service in a cheerfully yellow restaurant located just off the W&OD, next to Pure Pasty and Bikes@vienna. My only complaint is that I wasn't fond of the restaurant's incense, which was interfering with my sense of taste. They didn't look appetizing either. He deserves extra points for those. 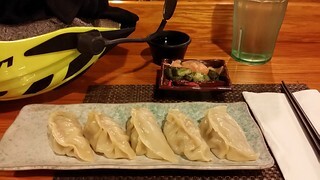 Dumpling ride #3: steamed pork dumplings at Sakuraramen in Adams Morgan. These were perfectly adequate traditional pork gyoza, although I prefer my own recipe (I use a higher proportion of vegetables, which makes the filling more tender). The best part was actually the dipping sauce, which was lighter and sweeter than most. Steamed lemongrass chicken dim sum at Bao Bar in Clarendon. Nice pillowy texture, mild flavor but a bit pricey.